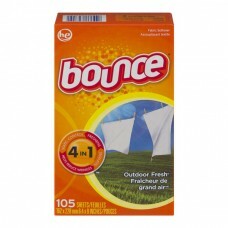 Bounce® 4 In 1 Outdoor Fresh® Fabric Softener. HE. Static control. Freshens. Helps reduce wrinkles. Softens. 105 sheets. 162 x 228mm 6.4 x 9inches. Benefits: Static control. Freshens. Helps reduce wrinkles. Softens. 1 sheet = regular loads. 2 sheets = large loads & HE full loads. Oh hi there, thanks for doing your part on recycling day. In part because of you, we can continue to make this box from 100% recycled paper (35% post consumer). Questions? Information? Call toll-free in U.S. 1-800-5-Bounce. 1-800-(526-8623). bouncefresh.com. ©2015 P & G.
Usage: Add a new sheet on top of clothes at start of drying. Discard after each dryer cycle. For Best Results: For large loads, use an extra sheet. Use low heat setting for synthetics. If spotting occurs at high heat setting, rub spot with a bar soap and rewash in warm water. Bounce is safe for all washables, but is not for use on children's sleepwear or other garments labeled as flame resistant as it may reduce flame resistance. Keep out of reach of toddlers and pets to avoid accidental ingestion. Bounce contains cationic softeners and perfume.